Nepal Skydiving adventure is one of the most unique travel experiences EVER! Nepal is famous for yaks, yetis, monasteries and most importantly The Himalayas. Who wouldn’t want a taste of the greatest mountain range on the planet? Does that mean all of us have to learn mountain climbing? No. So Nepal Skydiving is at your rescue. In Nepal, The Pokhara skydive is a rare experience and you want to get your hands on this rare opportunity from 7-12th November 2017. 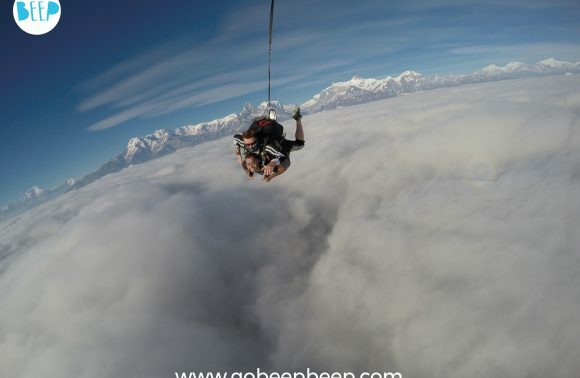 When you will be freefalling right above the Himalayas you will be on top of the world literally and figuratively. 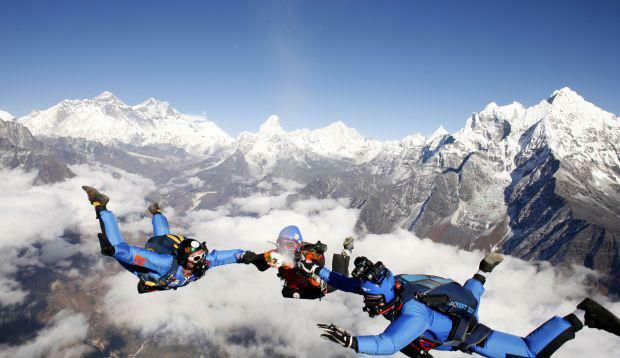 The famous Nepal skydiving specifically takes place in Pokhara over the Himalayan range. Also you are floating over the famous Pehwa Lake. 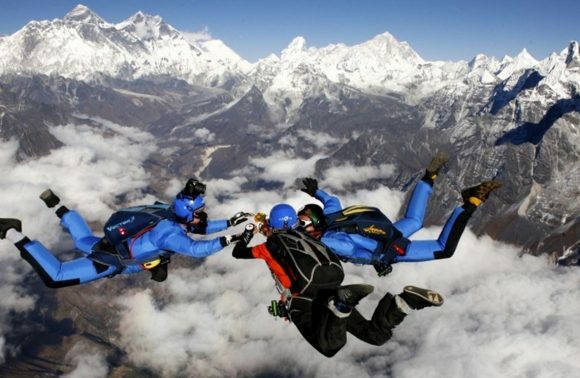 Skydiving in Pokhara is one of the many attractions offered by Pokhara, making it the adventure capital of the world. Check out the other mind blowing things to do in Pokhara here. What makes the Nepal Skydiving trip so rare? 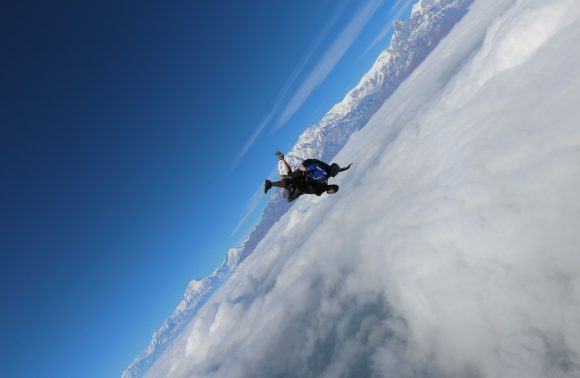 The Nepal Skydiving experience is extremely rare as this event is only hosted annually. The weather throughout the year is not ideal for a skydiving trip. Also special permissions are taken from the Nepalese Government as there is no Skydiving in Nepal generally. Hence, grab this opportunity ASAP! This annual event happens by bringing in a team of crème de la crème from around the world. These people will ensure you have an experience that will change your life. 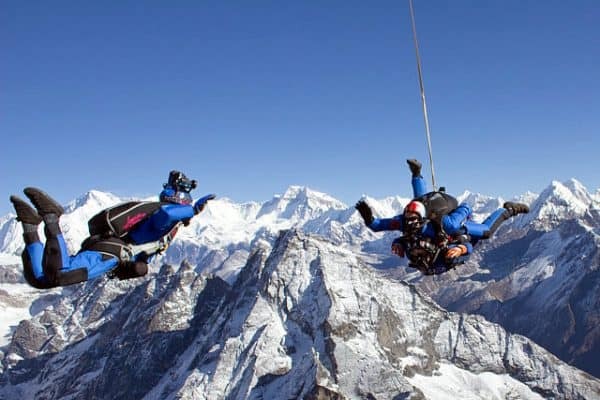 Who can experience the annual Nepal Skydiving adventure ? You can take a solo skydive if you hold a Skydive license. But not to worry, this event is open for everyone even if they have had no formal skydiving training before. 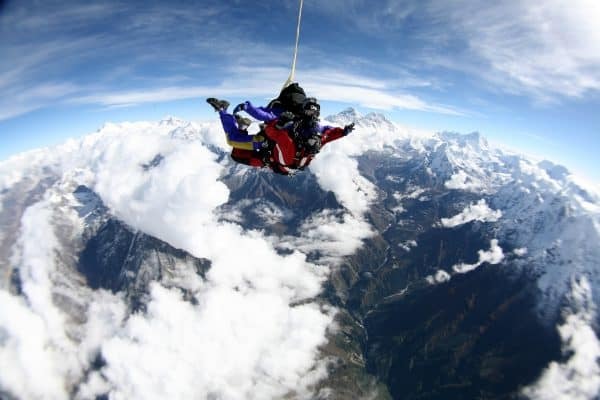 Again as the Pokhara skydive is a rare event only 20 lucky people will get to experience this. 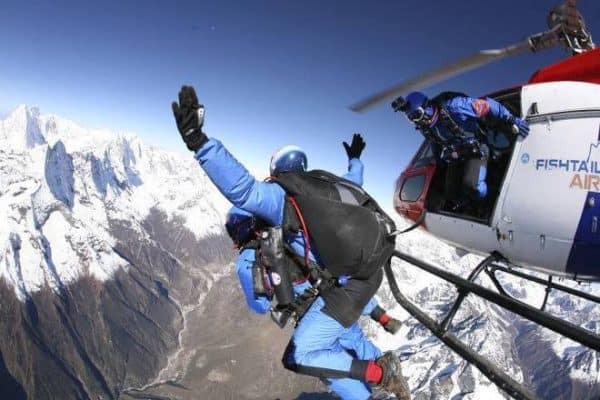 The cost of the Pokhara skydive will vary as Nepal does not have a formal Skydiving learning school. 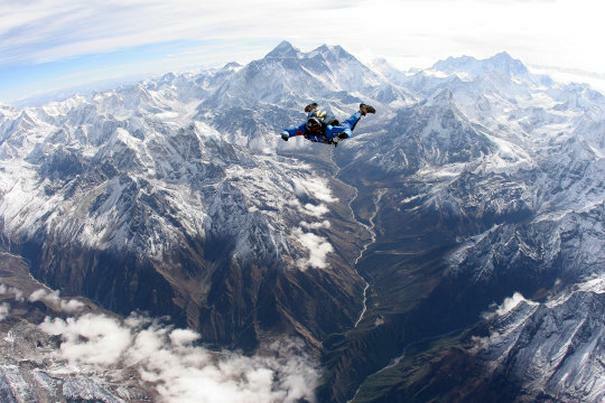 Skydiving in Nepal has been voted as the most scenic skydive in the world. I mean you are skydiving over the most majestic mountain range on the planet. You see snow clad peaks which only a few fortunate witness. No wonder this will be an experience of a lifetime. You will be flying my friends…LITERALLY !